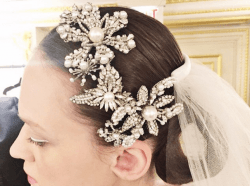 With the tiaras newly refound in the Indian trends and making it up to selfie studios, it’s time for something more exorbitant and dazzling and sparkling for the bride. 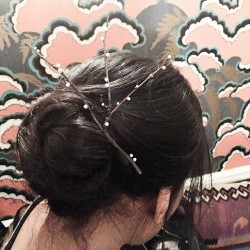 Embellished combs. Reminds me of Della in the Gift of Magi by O’Henry. And this piece of scintillating Hair fashion from Spring 2016 Runaway was no surprise to us. It being brought forth by Erickson Beamon, the design house which holds the flagship in jewelry made of glass and crystals and bead. And what sums to the perfection of it lending it a magical and enchanting finish is the legacy of the brand which employs the proficiency of artisans and craftsmen to meticulously assemble all the pieces of semi-precious stone. In similar lines, the crown made a big shot in the Hair fashion from Spring 2016 Runaway. Every girl is surely a princess in her own ways. All she awaits is the crown. 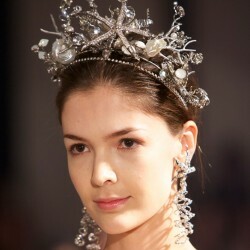 So crown her uniqueness with these mesmerizing and tantalizing pieces of beauty. Featured in collections of the renowned Indo-American designer Naeem Khan, presently based out in New York, this piece of stupendous elegance can charm up even the simplest and most casual buns and loops hairdos. But it goes the best with blonde brides. One of the unique ideas witnessed in Hair fashion from Spring 2016 Runaway was this hint of rawness, with nature- inspired wooden cut-outs for the hair. Twigs with pearl embellishments. We saw this emergence of a unique and fresh trend in the showcase of Lela Rose the New York City-based American fashion designer widely regarded for her elegant aesthetic and fresh point of view. This piece has in it a sense of refined sophistication with a hint of country life and this is what makes it marvelous. This nature-inspired cool and unusual piece of wonder, when tucked within the buns, will unwittingly enhance the grace of the ethereal bride. And the last but not the least, Hair fashion from Spring 2016 Runaway saw embellished braids that recreated the magic of Barbie and all the rest ice princesses embedded in every girl’s heart. This piece was witnessed in works of designer Reem Acra who is widely renowned for her innate understanding of women fashion based on body types and what looks and feels good. And her sense never disappoints. 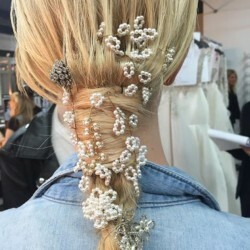 Here as well she succeeded in drawing our fascination and replenishing the charm of simple braids by embellishing them with pearls and jewels or appliques of the same to achieve an astounding look for the ethereal bride. Mention also needs to be made by one of the most seasoned hair stylists of today’s time, Joe DiMaggio, for the intricate and perfectly clean weaving of this idea into hair extensions, without which such surreal effects could never be achieved.